It’s the end of June and we’re at the midway point of a typical movie year. What is a typical movie year? Relax and read on! As some of you may know, the yearly movie schedule goes something like this: In September, the Toronto International Film Festival (TIFF) unofficially kicks off what I like to call the prestige picture period (PPP!). From then until the end of the year, the studios start to get really serious about awards, ‘movies’ start getting called ‘films’, and every movie has an Oscar winner in it. The exact reverse of that happens in the three to four months prior to the PPP. From about May to August we get the huge action movies, the blockbusters, the big time comedies, and, increasingly, the comic book movies (a subject for another time, I assure you). Here is where the entertainment comes at you, aggressively so, with every movie gunning for the best opening weekend ever. Finally, we come to the most bizarre and overlooked period of the year: January to April. Let’s break it down, shall we? January: A study in contrasts, really. On the one hand, you’ve got the leftover award season films that are getting wider release, but also, a serving of movies that could only charitably be described as ‘images on film’. February: Less remnants of the PPP pop up, with the amount of dreck steadily increasing. Here is where you get the sequels nobody asked for, terrible horror movies, and Nicolas Cage films (note: sometimes all in one movie). March: Now we’re getting somewhere. Here’s where we find the tepid blockbusters and misjudged films. Recent quintessential March movies? John Carter and Zodiac. The former was a big, expensive sci-fi movie that you just know Disney did not totally believe in (which, naturally, led to its sad demise) and the latter is actually the high water mark in David Fincher’s career that was, sadly, marketed so poorly few people appear to be aware this. April: I like to think of this period as something of a swing month. In 2012, we had the Avengers, which was so huge it basically just steamed rolled every other movie in its path but generally it’s not quite a true summer blockbuster month. This is mostly because a ton of Sundance, TIFF and other festival movies get released here in the hopes they’ll garner attention during the PPP once out on DVD later in the year (see: Seabiscuit, The Hurt Locker). So where am I going with all this? A mid-year 2012 review, of course! Now that we all understand the general tidal forces at work during the various movie seasons, I figured I’d highlight some of the better movies of those first few forgotten months, and skirt around some of the bigger movies released in May and June (and the Avengers, which we all love and is awesome and shawarma). Sneakily Underrated Films: Chronicle; Haywire; Jeff, Who Lives at Home. Haywire and Jeff, Who Lives at Home fall under the solid ‘big names, small movie’ category. Did you know Haywire was directed by Steven Soderbergh and it had a handful of the breakout stars of 2011/12 in it (Michael Fassbender and Channing Tatum)? Apparently not, since no one saw it. This is a shame because Gina Carano, while not exactly Meryl Streep, owns her role in a really economically told super spy story that has some great character acting turns from Michael Douglas, Ewan McGregor and Antonio Banderas (see, I told you a lot of people were in this one). Jeff, Who Lives at Home is a actually a nice contrast to a movie like Haywire. While the latter is all lean muscle and compact violence, the former takes its time to let us meet the characters, relax into the shaggy rhythms of their lives, and then, in a fitting conclusion, tie up the themes and plot in a convincing character study of a unique family. Hats off to the Duplass brothers for this one. Finally, Chronicle. The super hero movie told from the perspective of the super villain. Due to the backlash surrounding ‘found footage’ and shaky cam movies, I feel like this movie got a raw deal. Whenever I tried to tell people about it I could see their eyes glazing over the second I mentioned that it’s all filmed via cameras ‘held’ by the cast (you’ll understand the quotes there when you see the movie). But the device is used in such a clever way and successfully redrafts a ‘Carrie’-like story of teen alienation and power gone wrong in a fresh way for the new decade. Ok, I am definitely cheating a bit here. Monsieur Lazhar came out last year but got a wider release in the spring this year but I really want to talk about it some more because it is really, really, really good. Yes, it’s a movie about an outsider teacher coming to a school and changing the lives of some kids (who, you guessed it, may or may not also end up changing his life). But oh, to do it so succinctly, so successfully and to avoid the obvious clichés is such a breathtaking thing to behold. And it’s a Canadian movie! Really, go and watch it and have a good, joyful cry afterwards. 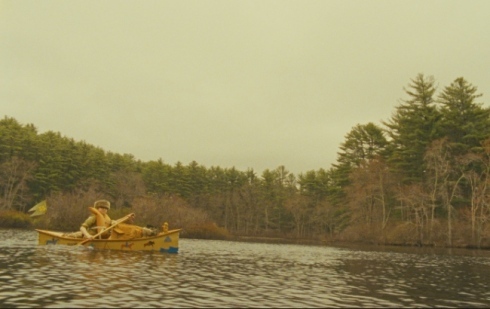 As for Moonrise Kingdom: great cast, astoundingly detailed production design, more mature, confident direction from Wes Anderson. The fact that we can describe other films as being ‘Wes Anderson-like’ probably means we’ve reached critical mass with him. I guess you should stay away from this one if you don’t like Bob Balaban narration or Bill Murray throwing his shoe at Bruce Willis. Trust me, I don’t want to say this, I really don’t, but.. well, Prometheus, for all it’s big ideas and beautiful visuals, is kind of dumb. I could poke some holes in the obvious stuff (the comedy stylings of the geologist/biologist duo, Guy Pearce in old-age makeup, the surgery bed in a woman’s chambers that is designed for a man, the whole running in a straight line thing at the end), but I’d prefer to just say this: I really wanted this movie to be good, I really wanted to think about it a lot afterwards, but for all its astro-philosophy, it just does not hold up to scrutiny. Ever see the trailer to a movie and think, “that could be really dumb but if they get it right it could be really awesome”? No one? Just me? Ok, let’s move on. My point is that Goon got it right. Yes, I will repeat, Goon, starring Seann William Scott and Jay Baruchel is my unlikely favourite movie so far of 2012. It’s not only the perfect sports movie but it has a sweet romance, a dabbling of buddy comedy and Live Schreiber as a Maritimer. You should go see it. So there you have it. There are some movies worth watching (and one disappointment) for the first six months of 2012. Full disclosure: I have not seen every movie that came out so far this year and there are some that are still worth watching despite not getting mentioned (We Need to Talk About Kevin, and did I mention The Avengers? ), but I’d like to think I’ve pointed you readers at some gems. Will these movies make it onto my top ten of the year? Time will tell. In the meantime, I’m going to go dream about watching the Dark Knight Rises. On to the next six months!